Blueberries are a popular, hardy shrub that produces the fruit of the same name. Blueberries are generally easy to grow, but have some specific requirements for the type of soil they are grown in. Once these needs are satisfied, they will reward you with a bountiful harvest every year. Blueberries, like many fruiting bushes, need to be grown in full sun. A lone blueberry plant will not produce fruit. A minimum of two different varieties need to be planted together to ensure that fruit is produced. Using three varieties has been shown to yield the largest crop. Ensure they are planted close enough together that a bee is likely to travel from one plant directly to the other; physical barriers between plants significantly reduces the likelihood that a bee will get to its intended destination. They work well in a row as a hedge – put each plant 120cm from the centre of one to the centre of the next and eventually they will grow together to form a low wall. The most important consideration when growing blueberries is the soil. Blueberries require acidic soil that is organically rich and well-drained. Most areas in south-western Ontario are not acidic by default, so you may need to amend the soil around the planting area. Dig out your new bed to a depth of about 1½ feet and discard the soil. Refill this hole with a mixture of about 50% peat moss, 25% compost plus, and 25% sand. Peat moss is naturally acidic, the compost adds a great deal of good organic matter, and the sand helps with drainage. Mix this concoction thoroughly. Do not use manure – it is far too alkaline for blueberries. The acidity of peat moss will likely not be enough to keep the soil at the right pH, though it is a good start. We strongly recommend using Rhododendron and Azalea food as fertilizer. It has a slightly higher middle number which will encourage flower and fruit production, and acts as a soil acidifier as well. Garden Sulphur is an acceptable substitute, though it only acidifies and does not have any extra nutritional value. You will want to fertilize every 3-4 weeks for the first season. In future years you can fertilize just once in the spring. Be on the lookout for signs of trouble with soil pH: poor leaf colour or lack of vigour can mean it needs another feeding; this second fertilizing should be done in the fall after the leaves drop. Very little pruning is required. Well-established plants may have the oldest stems cut out in spring. Cut out all damaged wood, branches that have grown too close to the ground from the weight of the fruit they have borne, and any that shows signs of disease. In February to March, cut some of the older canes (2 or 3) to the ground. Repeat the pruning every spring. If you intend on maximizing your harvest, you will have to compete with the birds! Before the berries turn blue, cover each bush or the entire bed with netting. The blueberries should not be picked as soon as they are blue but allowed to ripen and sweeten for a week or two. They are not ripe if the stem ends are still red. Go over the bushes daily or weekly as each variety ripens. We offer a wide variety of blueberries, all of which have different heights, widths, and ripening times. Black, Red and White Currants all make excellent jams, jellies, wines and juices. Unlike many other fruit-producers, currants can tolerate partial shade and will still produce as well as they would in full sun. Currant bushes may have to be netted to keep the birds away – many birds adore currant berries. Before planting dig the bed over and thoroughly work in a complete fertilizer according to the application rate. Almost any water-retaining but well-drained soil is suitable, though red currants do best in lighter soils. The only time soil will be a serious issue is in a poorly-drained area. Black currants are the most vigorous of the bunch and need to be spaced 5 to 6 feet apart in your bed. Red and White Currants can be spaced 4 feet apart. In late spring, feed with a balanced fertilizer. Adding a 2” layer of mulch can keep weeds away and help with water retention. The plants are especially susceptible to a potash deficiency, which causes the leaf edges to look scorched. DO NOT use a fertilizer known as Muriate of Potash as it can actually kill the plants outright. Your best defense against weeds around your currant is a layer of mulch. Currants are somewhat shallow-rooted, and using a tool or removing weeds by hand can damage the shallow roots. Take out any suckers that grow from the main stem or the roots. Black currants should never be allowed to dry out – they prefer slightly more moist conditions as compared to red or white currants. Currants can be pruned in a fashion that improves overall fruit production. This is done through a few easy steps over the years. Year 2: In the early spring of their second year in the ground, prune two-thirds of last year’s growth off of each branch if the branch looks weak and flimsy. If the branch is thick and strong, instead remove one-half of last year’s growth. Try to cut the branches back to a bud that faces outward rather than inward. If there are branches stretching horizontally rather than vertically, prune them all the way back to one bud from their base. Year 4: In the spring of the fourth year, do exactly the same except remove only one-quarter of the growth. Year 5 and beyond: Prune back about one inch each spring. Prune off any old, weak, or unshapely branches as you see fit. Black Currant Exception: Any branches that reach three years of age should be cut back right to the ground in the early spring. This forces the place to constantly rejuvenate itself and encourages even better fruit production. Gooseberries are excellent for fresh eating, preserves and pies. They are fairly easy to grow and are self-fertile, meaning only one variety needs to be planted for fruit to be produced. Plant it in a sunny site sheltered from cold winds; some shade will be tolerated. Gooseberries will grow in a range of soils, but deep, moisture-retentive soil is best. Gooseberries do not like excessively acidic soils. In south-western Ontario this is rarely an issue, but if the leaves become chlorotic (yellowing with green veins), then you may need to apply Dolomitic Lime to decrease the acidity of your soil. Remove all weeds from the site before planting and dig in plenty of manure or garden compost. If you’re planting a cluster or row of bushes, space each plant 1.2-1.5 m (4-5 feet) apart. After planting, prune (on a 1-2 year-old plant) all the shoots back to one bud to encourage strong new growth. Gooseberries can also be planted deep so that many branches protrude through the soil. If planted in this manner the free-growing shoots will carry more fruit, but the berries will be smaller and harder to pick. If you goal is to cultivate the berries for use in jam, jelly, or pies, this is the best choice. Very little pruning is required if you opt for this method. Alternatively, if you plant them at a normal depth, you will want to prune out much of the middle growth of the plant. This makes picking easier and the fruit ripens more quickly and becomes larger, though there is less fruit per branch. “An open-centre” approach also minimizes mildew problems. Each spring, apply a balanced fertilizer (20-20-20 or 7-7-7 are good). Gooseberries require high potassium levels. The best way to satisfy this is to add compost that contains well-rotted manure. DO NOT use Muriate of Potash (Potassium chloride); it will seriously harm or kill the plants. You may need to put netting over your bushes to prevent birds from escaping with all of the berries. Applying a dormant spray mix every year in early spring (before buds show green) is a great way to prevent any disease and insect issues. Some cultivars have a natural drooping habit. To prevent stems from trailing to the ground, prune to inward and upward-pointing buds, particularly with younger plants. This may seem counter-intuitive, as often you want to preserve the buds that face outward, but this method will encourage a narrow, upright growth habit. With most other plants, you will want to disregard this advice. A one-year-old bush should have 2 or 3 strong, young shoots; shorten these by half in early spring. Harvesting gooseberries is quite easy – gently twist the berries off once they’re ripe – but be sure to wear gloves! Many varieties have thorns. Grapes have rapidly grown in popularity in home gardens over the last decade. Many new varieties are hardier, more productive, and more disease resistant than ever before. Grapes are great for fresh eating, for jams and jellies, and of course, for wine-making. They are among some of the more challenging fruits to successfully harvest, but with good preparation and care, they can be very rewarding to grow. Pruning is especially important; for tips on how to prune your grapes, we have a section devoted to it at the bottom of this page! If you’re still unsure, please consult with our knowledgeable staff. A warm, sheltered, sunny site free from frost at flowering time is crucial. It takes a fairly hard frost to damage the grapevine itself, but even a light frost at flowering time can ruin an entire year’s crop. Grapes need reasonably fertile, well-drained soil, and slightly acidic to neutral soil is best. Avoid planting them in very rich soil – this encourages excess growth at the expense of fruits. Very good drainage is essential because grapes do not tolerate wet soils. Cultivate the soil thoroughly before planting and remove any weeds. In poor or sandy soils, add compost or peat moss. If you wish to grow multiple grapes on wire trellises, they should be planted 2.5 -3m (8-10′) apart. Those grown on an arbour for shade should be planted 120cm (45-50″) apart. Water thoroughly during the growing season whenever conditions are dry, reducing watering gradually as the fruit ripens. Particular care is needed with grapes grown on a wall if the overhang prevents rainfall from reaching the roots. Mulching helps to retain moisture. Once vigorous young shoots develop, feed with a high-potassium fertilizer (15-30-15) every two or three weeks; if growth is poor, give higher levels of nitrogen (20-20-20) instead. Stop feeding as soon as the fruit starts to ripen. There are two types of raspberry: summer-fruiting, which has a short season of heavy cropping in midsummer and fall-fruiting (everbearing) which has an extended cropping period beginning in late summer and continuing until the start of severe frost. Raspberries are self-fertile. Raspberries do not crop well on poor soils, particularly if they are in competition with weeds. Raspberries should be planted in a sheltered sunny location. They will tolerate partial shade. The soil should be rich in organic matter, moisture-retentive, but well-drained…..raspberries do not tolerate poor drainage. Sandy, alkaline and poor stony soils need annual heavy dressing with organic material and regular watering. If raspberries are grown in lime-rich soil they suffer from chlorosis. Clear all perennial weeds before planting (they are too difficult to eradicate later). Prepare an area at least 90cm ( 3′) wide and dig in plenty of well-rotted manure. For a post-and-wire support, set a single row of stout posts 3m (10′) apart. Run three lengths of wire or nylon string at heights of 75cm (30″), 1.1m (3 1/2′) and 1.5m (5′). Keep the wires or strings taut and tie in the canes with twine (weaving the canes between the wires) to prevent the canes from being blown over. The parallel wire method requires two rows of posts with the above spacing and rows 75cm (30″) apart. Run two parallel wires along the posts, one pair at 75cm (30″) and the other at 1.5m (5′), then criss-cross between them with wire or strong string. The canes are supported by the crosswires and do not need to be tied in. Plant in spring or early fall in well-manured soil at 38-45cm (15-18″) intervals in rows 2m (6′) apart. Spread the roots evenly at a depth of 5-8cm (2-3″) and gently firm in. Prune canes to 25cm (10″) from the ground. As soon as new canes are established (mid-summer), cut out the canes that were shortened at planting time. Summer-fruiting raspberries should have all fruited canes pruned to ground level after cropping. Tie in new canes spacing them 8-10cm (3-4″) apart. Cut out damaged and weak cane. At the end of the growing season, loop tall canes over the top wire and tie them in. Before the next growing season begins, tip prune all the canes to a healthy bud. The cut should be made approximately 15cm (6″) above the top supporting wire. Remove dead, diseased or crowded canes or any growing more than 22cm (9″) from the row. season’s canes. Prune the fruited canes down to the ground in late winter before growth starts; this stimulates growth of new canes which will fruit in the fall. In spring mulch with well-rotted manure applied on either side of the row taking care not to bury the canes. If manure is not used, apply regular dressing of a balanced fertilizer and mulch with compost or leaf mold to conserve moisture. Remove weeds (be careful not to damage shallow roots) and water the plants regularly and thoroughly. Remove any suckers more than 22cm (9″) from the main stem. Black and Purples raspberries produce new canes from buds at the base of old canes; they have no buds on their roots therefore they do not “sucker”. The long canes will arch over until the tips touch the ground, take root and produce new plants. Allow this to happen ONLY if new plants are desired. When new shoots are 90cm (35″) tall, snip off the tips. This results in vigorous side branches, which are pruned back to about 30cm (12″) in early spring. DO NOT plant black or purple raspberries CLOSER THAN 100 feet to red raspberries as they may infect one another with viruses. A very hardy perennial that requires a sunny permanent place in the home garden. It can produce a crop for many years, often 20 or more. Dig a deep hole, a least 60 cm (2′) square by 38 cm (15″) deep. Fill the bottom of the hole with well rotted manure or compost, add some topsoil and a handful of bone meal and mix well. Replace an inch or two of topsoil before planting the roots. Every clump or root should have at least one strong bud that should just barely be covered by soil when planted. Water thoroughly and mulch after planting. Under favourable conditions, each root will develop strong plants in one year. Divide rhubarb clumps every 5-10 years in spring or fall or more often for propagation purposes. Top dress plants each spring and fall with well rotted manure or use a complete fertilizer. If mulch is used to control weeds and save moisture, pull the mulch back before spreading manure. DO NOT harvest the stalks until the second year and only in small quantities. By the third year stalks may be pulled (never cut) through the 8 week harvest period. Grasp the stalk firmly near the base and give it a sideways jerk, it will come away cleanly from the crown. NOTE: STALKS ARE EDIBLE BUT THE LEAVES ARE VERY POISONOUS !!! Strawberries grow well in hanging baskets, especially well-designed strawberry barrels. Strawberries also grow well on decks and apartment balconies. A planting of 25 to 35 plants will provide the needs of a family. If possible choose a sunny, south-facing slope. With good drainage, there will be less danger of spring frosts damaging the blossoms. The cold air will move to lower lying land. Do not plant in an area where strawberries, raspberries, potatoes, tomatoes, peppers or eggplants have been grown in the previous 4 or 5 years. A soil fungus that causes root rot can build up when these crops are grown frequently in the same space. Incorporate well-composted manure and peat moss into the bed. Organic matter improves the soil structure and retains nutrients. When planting in a flat area, mound the soil to provide surface drainage. Strawberries are harmed if water is present for even a few days. The best time for planting is in early spring, as soon as the soil can be worked. Space the plants 45-60 cm (18-24″) apart, in rows 90-125 cm (35-50″) apart. Water in with a transplanter fertilizer. Strawberries are fussy about being planted just right. 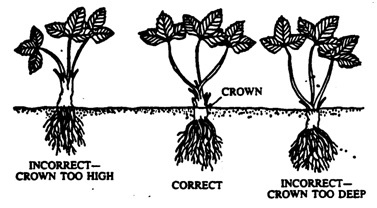 The mid-point of the crown should be at soil level. Watering is the most important task in growing strawberries. Strawberries generally require one inch of rain or equivalent irrigation per week during the growing season. Do not let plants wilt from lack of water. Good drainage is important; do not allow the bed to become soggy as root rot diseases may develop. Remove the blooms from June-bearing strawberries in their first season. On everbearing strawberries remove flowers in early spring to encourage more and better berries later in the year. On June-bearing varieties, as soon as all the fruit has been picked, cut down the plants with shears to about 3 inches above the crown. Pull off any unwanted runners and old diseased leaves. Rake off litter and destroy it. Renew strawberry plants every 2 or 3 years. After this time they will not crop so heavily, and disease is likelier. New plants can be raised easily from existing plants. In fall, to conserve the plants’ energy, cut off any runners that have grown. In late winter apply a complete fertilizer according to directions on the package. If growth has been poor, apply more fertilizer along rows in mid-spring. In spring control weeds with shallow hoeing. Do not remove leaves from everbearers, as this will destroy new growth, but clear away some of the old leaves. Renew plants after one or two seasons from runners or purchase new plants. When the developing fruits are heavy enough to almost reach the ground, tuck clean straw beneath the berries and around the plants. An alternative is to use plastic sheeting to keep the strawberries off the ground. Be sure the soil is moist before putting it down. Using wire loops to hold the strawberries off the ground works well too. Straw is the best mulch as it is usually free of weeds. The straw should be applied after there have been several light frosts, and the ground has started to become frozen. The plants will be dormant. If applied too early, the crowns may rot. Selective pruning has been done for thousands of years, and is (arguably) one of the first few techniques used by farmers in ancient times shortly after agriculture itself was developed. Pruning fruit trees is often thought to be work-intensive and difficult, but this really is not the case – don’t be intimidated! Once we understand why we prune fruit trees, it makes it dead easy to determine when, where, and how much we should be pruning. There are two major reasons we prune fruit trees: the first is to maintain the overall health and vigor of the plant, and the second is to control the growth of the tree to make it easier to harvest (and also to increase its yield where possible). Where two branches are closely parallel or cross over one another, remove the least desirable one: if you’re not sure which to remove, pick the one that will leave the most horizontal and/or vertical space for other nearby branches. Now that the basics are out of the way, it is time to explore pruning as a way to control the growth and yield of the plant. You can prune at a number of different points in the season and each time period will produce a different result. These options – dormant pruning, early summer pruning, and midsummer pruning – are explained in more detail below. Early spring is the safest time to do any and all corrective pruning including removing damaged or crossing branches. Dormant pruning will produce the most vigorous new growth than any other type of pruning. Avoid extensive dormant pruning on trees whose mature size you are trying to limit or reduce. The safest time to dormant prune is just before the leaf buds begin to swell. Be warned: peaches and nectarines are more sensitive to cold damage, so consider pruning them later in the season as needed. Early summer pruning is very effective at “dwarfing” a fruit tree. If you desire to limit the ultimate mature size of the fruit tree in question, this is a good time to do so – June or early July are best. Midsummer pruning is less effective at reducing the eventual size of the tree, but it is the best time to reduce the current height and width of the tree. Midsummer pruning can also be used to tweak the size and sweetness of your crop. New growth can be cut back by 1/2 to 2/3 on a well-established tree. This will allow more direct sunlight to nicely colour up the fruit: by reducing the total vegetative growth (the leaves) it frees up sugars and other nutrients to travel to the fruit instead. Be aware that doing this improves the flavor but may reduce the overall size of the fruit slightly. Making a pruning cut on smaller fruit trees is fairly easy. Make your cut flush with the limb from which the unwanted branch is attached. The only exception to this rule is the peach. To prune a peach you use a technique known as ‘collar cutting’. A collar cut is a cut made perpendicular to the unwanted branch, and is made just beyond the point at which the branch separates from the parent limb. If you’re still unsure, ask our knowledgeable staff and we’ll be happy to provide further advice or perhaps an in-store demonstration! There are literally thousands of years’ worth of literature on the maintenance and pruning of grape vines. With good pruning practices, you can maximize your yield and improve the overall health and disease resistance of your vines. This section is by no means a comprehensive guide to the pruning of grapes, but it can provide you with the basics you need to establish a healthy, productive grapevine in Ontario. To begin, we need to understand why we prune. Firstly, it is important to understand that grapevines are not reluctant to fruit. If left unpruned, in a few short years a grapevine would be capable of producing an amount of fruit so excessive that the vine would be unable to provide the energy required to have all this fruit ripen properly. Secondly, grapevines produce the bulk of their fruit on the previous season’s growth; growth of two years and older is not fruitful. Lastly, we prune to ensure there is an adequate amount of airflow between the leaves of the plant. This discourages mildew and other fungi from taking hold and spoiling your crop. So in summary, when we prune grapes we are trying to create a happy medium between encouraging plenty of fruit-bearing growth while not overwhelming the plant’s ability to supply this growth with the energy it needs to ripen. The last thing to be done before diving into the pruning itself is to clarify a few terms. Cane: Simply another name for the thicker branches growing from the grapevine’s main trunk. Spur: A short, pointed knob that extends from a branch. Shoot: Thin, pliable new branches that can grow from older branches or even from the roots. Purchase your grapevine in early spring. As soon as you’ve planted your vine in the ground, anchor a sturdy wire trellis adjacent to the new vine, and you’re ready to go. Your new grapevine may be a mess of brambles. This is OK. As soon as you’ve planted your vine, reduce the entire plant to one single sturdy stem. Pick one that is centred and straight. Prune the lone stem back to three buds. Your vine will quickly develop an abundance of new green shoots. Once these shoots have grown between 8-12 inches, choose the best one and support it by tying it to a stake – tie it at the top as well as close to where it emerges from your single sturdy stem. Choose one that is as vertical and strong as possible, and ensure it is coming from the stem, not the roots. Once this is done, remove all other shoots. Throughout the first season, you will have to continue tying the shoot periodically as it grows up the stake. Do this as frequently as possible – this shoot will be your permanent trunk for the life of the plant. Make sure it is as straight as possible. The next time you prune will be in the early spring of year two. However, there are a few possible scenarios. Scenario 1: Your vine hasn’t yet reached a height of 30 inches total. If this is the case, prune the entire vine, shoots included, all the way back to three buds on your single sturdy stem. Essentially, you’re going back to step 1. This is nobody’s fault – it’s just part of the process of ensuring a vigorous, healthy vine for years to come. Repeat steps 1 and 2 this year. Scenario 2: Your vine has exceeded 30 inches. Very vigorous plants may have gone far above this height and put out sturdy lateral branches near the top. This is good news! Choose the two lateral branches that are closest to a wire from the trellis, and prune them back to 3-5 buds. Tie the main stem to the stake and wire again, and then cut the main stem back just above the lateral branches you’ve chosen. If you are successful, your vine should have a “T” shape to it. Once you’ve successfully completed the previous steps, you have laid the groundwork for a healthy, vigorous vine. Now your focus shifts to controlling the growth of new canes. Follow these pointers on a yearly basis and you will be rewarded. Each year, select one or two canes with 8 or so buds on either side of the “head” of the vine (the intersection of the “T” shape), tie them to the wire, and cut all other canes out. Ideally, the ones you choose should be as thick as your pinky finger and should be close to the “T” junction. In addition, leave one or two “spurs”, but cut them back to two buds each to provide additional pruning options for the following year. The final note on maintaining healthy grapevines concerns the removal of redundant shoots. Each grape shoot needs 14-16 well-exposed leaves to properly ripen the grapes that appear there. Shaded leaves only function at 6% of their capacity, so thinning out weak or crowded shoots helps the remaining ones to get the energy they need. The best time to do this is in June or as soon as fruit clusters can be seen. Try to leave 3-4 inches of space between shoots. If there are multiple clusters on one shoot, keep the one closest to the main branch – it will ripen the most effectively. Remove the other clusters.